I got to our usual McDonald’s that we meet and Amos and Andy were already there and finished their breakfast. A little while later Steve arrived, then Katy and Pete. As we were getting ready to pack up the cars Krista arrived, just in time. Don’t trust those online directions. We divided into two vehicles and took off to meet up with Bill near the cave. Of course I’m running behind schedule and was about 15 minutes late. 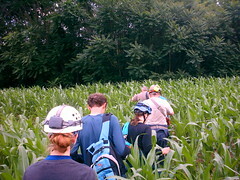 But we all did get together and got to the cave, suited up, and carefully walked through the rows of corn find the entrance to our adventure for the day. No one had been there for about a year and a half. The “gate” was filled with all kinds of debris. There’s not enough room for more than one person to work in there. It took Bill about 20 minutes or so to clean out the entrance and unlock the gate. Then one at a time we slid down the tube into the cave. 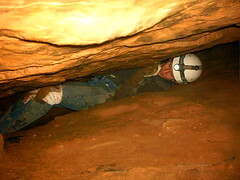 Many years ago before I had a chance to get into this cave I heard someone describe it as “sporty”. I now know that “sporty” means tight and a lot of work to move around in. A good bit of the passages are tight enough I just fit chest-to-back between the walls. There are some passages that open up a little more and one fare sized room. There’s also a lot of opportunity for scrambling. Sliding down the “cork screw” is not so bad. Just push your shoulders into the walls and slid down. But climbing back up is, well, challenging, especially for us bigger guys. All in all a well worth the effort. A great little cave to spend a hot Sunday afternoon in. 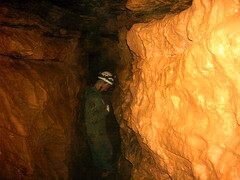 Take a look at the pictures and you’ll get an idea how tight this little cave is.